The Clayton Whites Hotel is a legend inextricably woven into the social, cultural and artistic history of Wexford. From as early as 1715, local historians believe that a lodging house called The Kings Arms, existed close to the present site of the hotel. It is well recorded that Whites was a militiamens lodging house in 1779, surviving the bloody insurrection against the English in 1798 when the Coffee House was mentioned in the diary of a survivor. 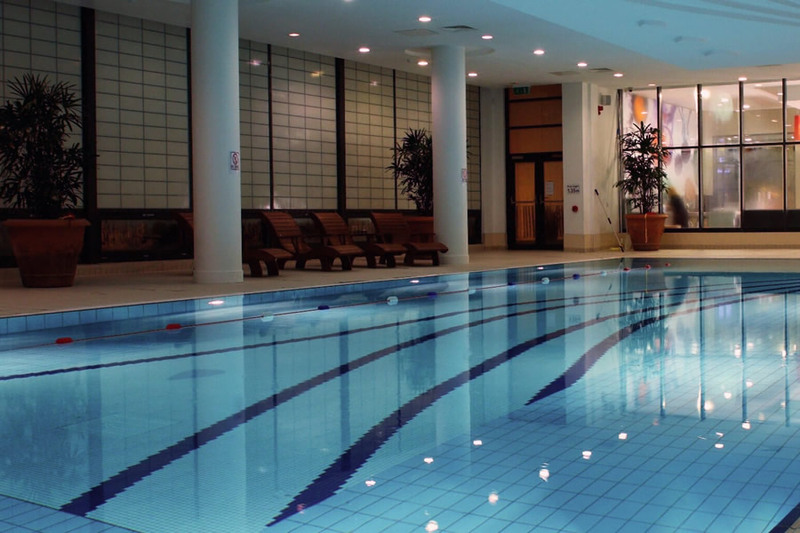 Our town Centre location and our proximity to the coast enables you to do anything from quad biking or scuba diving, to pleasure cruising on the river Slaney or sightseeing in the local historical area. Enjoy shopping in Wexford town or an array of sporting activities from golfing to sailing and many more fun activities. Nice hotel, good rooms, spacious, great pool area, stay went very well but unfortunately very slow service in the restaurant and bar areas. Plenty of bar staff but was ignored for 10mins. Not enough staff in restaurant causing long delays and wrong orders. Food was just average and quite small portions with sharing veg/mash bowl. Great hotel. Lovely staff and great food. Had a twin room only complaint the beds were very narrow so didn't sleep well. my husband and I stayed 1 night for our anniversary. we found the Hotel really lovely and very comfortable, atmosphere great and staff so friendly. The food was very nice and breakfast was plentiful. Fantastic short break in a we will be back. Great price, great hotel, great location, couldn't ask for more! We booked a family room for 2 adults and 2 kids. Though we arrived early at 2.30pm our room was ready for us including the fridge we requested at short notice. Our room was on the 4th floor and had a lovely view towards the coast. Though a little worn in places, the room was perfectly clean and spacious with air conditioning. We were supposed to have a rollaway bed for the 2nd child but instead we had a proper bed added, which I much preferred. The kids loved the rice krispie buns left with a welcome note and details of the complimentary kids club too. All considered this break was excellent value and look forward to a return visit. Very nice Hotel. Great Breakfast in the morning, swimming pool was great. Room was comfy and clean - everything you would want. Location is extremly central in Wexford Town. Endless pubs, shops and eateries to choose from. Would happily return for another visit. First class hotel. Rooms are very spacious and clean. Food was excellent from breakfast to dinner and the staff are very friendly and efficient. Good wifi throughout the hotel. No hesitation in recommending this hotel. Clayton Whites hotel was above and beyond our expectations, from the reception desk to the room to the food, everything was first class. I would highly recommend this hotel. Very disappointed with the room I got on arrival I had requested rooms on the second floor as I had 2 rooms booked they only gave 1 room on the second floor and 1 room on the 5th floor when I asked to be moved to the second floor I was told there was none available (this was untrue as I had spoke with people that only arrived on Saturday and got a room on the 2nd floor. The room on the 5th floor was not what you would expect from a 4 Star Hotel. The cleaning of the room was not the best when I returned from shopping on the Saturday there was dirty water in the sink and I had to ask for toiletries. It was my Mum's 90th Birthday treat and I felt this put a dampner on it. That was my third stay in the hotel . Just to mention I was also told that because of the price I got a standard room that being the 5th Floor. I think this should be mentioned when making the booking. Very dissatisfied Customer. Lovely hotel, food was brilliant. Will certainly be back. Really good. Got top floor upgrade for 10 per night. Staff are great. Excellent value for money. Brilliant location. Only one minor complaint, no hair dryer in the bedroom on arrival. Very smooth and friendly check in, comfortable beds in a very clean and modern room. Great food (dinner and breakfast) with great service from very caring staff. We'll be back. We stayed in The Clayton White hotel for three nights last week. It was a lovely hotel. The staff were so helpful and friendly, every place was spotless and the food was great. I would highly recommend this hotel. Quality of food good but not hot enough. Reception Staff & Bar Staff not very friendly . Fantastic stay. Beautiful hotel with better breakfast than I would expect in a 5 star hotel. All staff were very helpful and especially the bar staff who went out their way to ensure guests were happy. I would prefer Irish reception staff and they could be a little friendlier as it is the 1st impression that guests receive. Also, I believe that the car park should be free. Other than these few points, we really enjoyed our stay and will be back again. Absolutely fab break had by us all. The food was excellent, staff very friendly and very helpfull. Entertainment in the lounge very good. Leisure centre very clean and staff also very friendly. As we had children in our group we also noticed the hotel is very spacious and child friendly. Will definitely be going back. Great location in the centre of town. Smooth check in and room was very spacious and spotless clean. We had dinner included and found staff to be very courteous and efficient. Food was very good also. Breakfast can be a bit chaotic as everything in the buffet is spread out quite far apart so it could take a while to actually sit down. All in all would definitely to back and we enjoyed our stay. A very large but nice hotel indeed, modern slick, stylish...really. The bedroom was lovely, and very comfortable, bright and clean, breakfast was excellent too. the only issue in the very hot weather was the window wouldn't open and the air conditioning wouldn't go below 19degrees, so I found it too warm at night. However when I complained they did their best to improve the situation. We were simply a little unluck with our room. BUT talk about value for money...I highly recommend it. The location is superb, and wexford is a lovely small town. Stayed in Whites Hotel for 3 nights b&b and 1 evening meal. Had a great few days and found the hotel and staff great in all departments. Will recommend to friends and family and look forward to staying again. Nothing to complain about at all. Thanks. Hi, My wife & I stayed for 3 nights for a much needed break. We had a lovely relaxing time and felt really refreshed on departure and this was thanks to the great service that was provided by Whites of wexford. 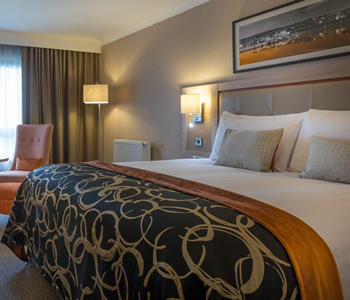 The Staff are excellent, food was fab, rooms were very comfortable & spacious and the location of the hotel was ideal, right in the middle of wexford. All in all we had a great break and will definately be back again this year, highly recommended. Thank you Whites of Wexford for a fabulous stay. My family and I stayed for 1 night. The location is great. You step out of reception and into the heart of Wexford town. The hotel is lovely, reception, the restaurants and bar areas are all very open planned whilst cleverly very individual areas. Our room was very spacious and clean. The 'z' bed for our youngest was a little lumpy, but that would be the worst thing. Our bed was very comfortable. Room included all you could want...tea/coffee, an empty mini bar...space for my kids own drinks, iron, complimentary toiletries and enough towels for the whole family without having to request more. The food - our deal included dinner, we upgraded to the å la carte menu for an extra €5.00 the food was fantastic...beautful! The staff, reception, chambermaids, restaurant and bar...everyone was very pleasant, most helpful when asked for assistance and in general made this a great stay. Thank you to you all. The leisure facility was clean and modern enough, just a shame the staff here are not quite of the same calibre as the rest of the hotel. Great value for money. We had one night b&b and 1 dinner. Dinner very basic but Breakfast was fantastic. Kept us going for the day . If both of you are having breakfast together a handy tip would be for one of you to do the toast while the other orders breakfast (carvery style). When we were there queue for toaster . Put the do not disturb sign on your door at night . Housekeeping came knocking at 9am even though we didn't have to check out till midday. Try the fish pedicure , great value 10 euro for 15 mins. Whites of Wexford is one of the nicest hotels that I have ever stayed in. From the location to the excellent food and service it is second to none. Enjoyed my stay tremendously. Star Rating 5. Great family hotel! Very helpful and friendly staff. Clean and spacious rooms. Great location. Disappointed with location of our rooms. Asked for sea view and got confirmation that we had but not so. Awful view even though I booked well in advance. I stayed in this hotel before and I think we must have been given rooms in a more modern part than this time. Long walk for my feeble 87yr old mother. Never offered a wheel chair. Corridor carpets dirty. Rooms were not adjacent as requested. One of the bedside lamps did not work. TV3 not working and had to ring reception to find that out. Toilet rolls not replenished on first day. Entertainment & food very good. Overall I felt the hotel had gone down since I stayed before and in general the hotel was a little jaded. Noticed courtyard could have been maintained ie flower tubs, hanging baskets etc. Location of SPA not really suitable for a mobile challenged person so there should be some way of making it easier to bring them there to make the experience more relaxing as this was the whole point of our break. She had to walk ages and climb steps. The alternative seemed to entail even more walking. Also in general signage very poor. It was like a mystery tour finding the various areas. May 2014. No problems with service. Very helpful and friendly staff, especially those at reception. However, 'standard room' was a big disappointment. Very small to start off with and the bathroom really wasn't that of a 4 star hotel at all with many basic facilities missing (e.g. no shampoo or body wash in containers in shower, no bin). Also the shower didn't work properly and had no curtain or screen to prevent water from splashing out over rest of bathroom. Food (i.e. breakfast and afternoon tea) was average. Not many healthy options. very comfortable, clean. excellent breakfast and evening meal. helpful reception staff. May 2014 - We booked a very good deal the night before our arrival. We were pleasantly surprised by the quality of the hotel, bar, restaurant and leisure facilities (we have booked similar deals elsewhere which have not been as satisfactory). 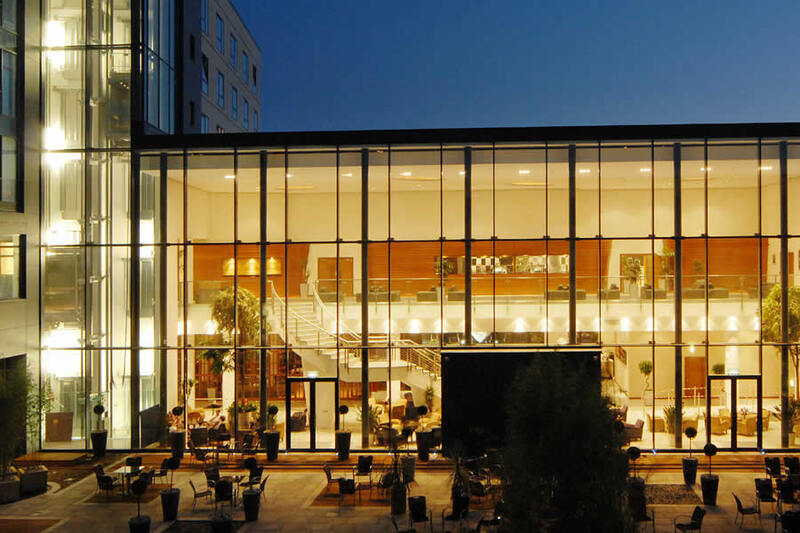 The hotel is modern and bright, the lobby, coffee dock and bar areas are spacious with plenty of seating enabling you to relax and watch the world go by. The hotel is also very centrally located, ideal for shopping. Very good value for money, would definitely return!